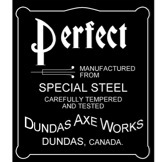 The most renowned axe manufacturer located in Dundas, Ontario experienced recognition under or associated with a number of different names including the Dundas Edge Tool Works, the Dundas Edge Tool Company and the Dundas Axe Works. The earliest owner was George Levitt (possibly also Leavitt) who is attributed with being the first to establish an axe manufactory in Dundas. It is understood that the original operational name of that earliest axe manufactory was, in some cases, the Dundas Axe Factory when it was owned by George Levitt, but considering the year in which it originated in may have also operated as George Levitt and then George Levitt & Co. The Dundas Axe Factory name may have been used interchangeably as a matter of convenience and local usage. George Levitt did his apprenticeship at the Gartshore Foundry (ca. 1839+). After that he apparently established the Dundas Axe Factory. The business was also called George Levitt and later on George Levitt & Co. Levitt owned the business from 1842 until 1852. During that time Jeremiah Hourigan may have apprenticed there. He was then employed as a blacksmith there and eventually became foreman. Different accounts use the name Jeremiah as well as James Hourigan. Information provided in family papers indicates that Jeremiah and James were actually the same man and that did use both names but an explanation is not available. The Dundas Axe Factory changed hands in 1852 when Levitt sold it to Robert Holt. It was then that James Hourigan became superintendent of the works. Mr. Holt operated the business until 1859 when the facilities were significantly damaged by a severe fire. Rather than reopen the works himself, Holt sold what remained of the facilities to James Hourigan. Later in the same year, 1859, Hourigan rebuilt but in a new location. The new works were located on Hatt Street, no longer at the end of Main Street. The Hatt Street location had previously housed a planing mill. It is believed the new operation used much of the equipment salvaged from the original Dundas Axe Factory but that has yet to be corroborated. The sale resulted in the continuance of a major edge tool maker in Dundas. The new operation was called the Dundas Edge Tool Works. 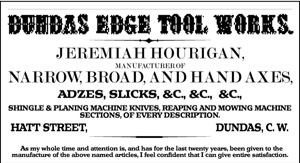 As the new owner, James Hourigan, rekindled the axe making operations and added the manufacture of other edge tools. They made axes, adzes and machine knives. During its years of operation, 1859 through 1910, the Dundas Edge Tool Works involved various partners. One was a Mr. Cosgriff from 1871-1873. The company name is reported to have been changed to The Dundas Edge Tool Co. Some information indicates that was in 1870, other information suggests 1873. The next partner was R. T. Wilson from 1878-1887. James (or Jeremiah) Hourigan actually passed away in 1878 but the Hourigan family also continued to be quite active. From 1887 until 1910 Peter Bertram was a partner but James reportedly had brought a number of his sons into the business before that. Of his twelve children at lease six were sons. The five that were involved in the business were James, Jeremiah, Michael, William and Joseph. Another son, John George, worked on steamships but drowned in 1870. The name Gerald has also been mentioned as a son in at least one account but it may be that that was a mistake. When James (Jeremiah) Hourigan reportedly died in 1878 he had already been succeeded by his son Jeremiah Hourigan, He had taken control by 1866. An advertisement bearing his name appeared in an 1866 Canadian Classified Directory indicating he was in the top management position at that time. His involvement resulted in increased production and by 1870 the production output of axes reached 30,000 per annum. In 1874 the Dundas Edge Tool Works also experienced a major fire but it was rebuilt quite rapidly and continued to be run by Jeremiah. The business continued until 1910, quite possibly with one or more of the other sons running it in conjunction with Peter Bertram. 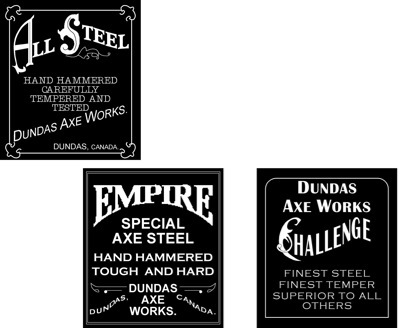 Some labels are known that included the name of the Dundas Edge Tool Works while many more are known to have included the name Dundas Axe Works. Facsimile of an advertisement published in the 1866 Canadian Classified Directory. Representation of stamped markings used on opposite sides of a broad axe. The initials represent James Hourigan. 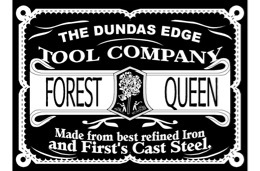 Facsimile of earlier Forest Queen label used by the Dundas Edge Tool Co.
Facsimiles of axe labels used by the Dundas Axe Works as shown in copies of Hardware and Metals magazine, in 1907. This write up has been revised from the earlier posting. Inventory of Major Canadian Tool and Die Manufacturers from 1820-1914; complied by The Tool Group of Canada. Canada Classified Directory, 1866 . French, Gary: Correspondence regarding George Leavitt and the early history of the company. Hofman, Sheila: Gr., Gr. granddaughter of Jeremiah Hourigan. Personal correspondence incl. notes from family papers. Townsend, Raymond; Check List of Early Axe and Edge Tool Makers in Ontario, ca 1970s. Klenman, Allan; The Hourigan Clan, The Chronicle of the Early American Industries Association; Dec. 1990, Vol. 43, No. 4, pg. 93. Other resources, some available on the Internet. The labels and markings were observed in the field and/or redrawn based on directory and/or magazine advertisements. They have all been drawn by the author. It is believed that at least some of the Dundas labels were printed in color but the colors involved are not currently known.